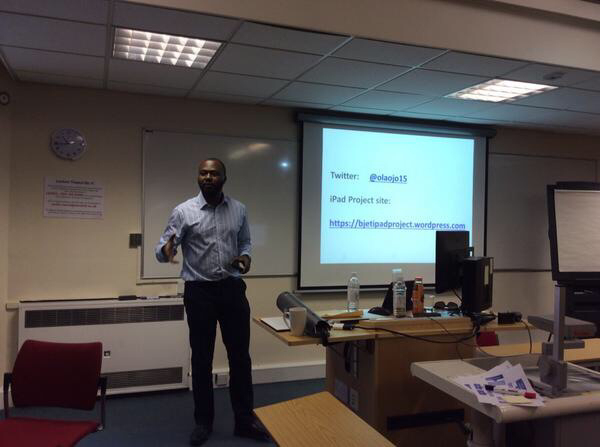 I presented the findings of the HEA’s “Changing the Learning Landscape” (CLL) funded project at the ALT-Conference in Warwick. The presentation was well received. Fiona Harvey and Tamsyn Smith (University of Southampton) attended my session which was great because University of Huddersfield’s iPad (and other tablets) Coffee Club was inspired by Southampton’s iPad (& alternative devices) Coffee Club. http://ipadsinhe.org/wp-content/uploads/2014/04/ihe_2014_proceedings.pdf (from page 191 – 198) for more information about the Southampton’s model. Here are some tweets and more photos (courtesy Tamsyn Smith) from my ALT-Conference session. My British Journal of Educational Technology (BJET) article based on the BERA funded project was published a couple of weeks ago: How and why academics do and do not use iPads for academic teaching? Please check it out and let me know if the findings are similar or different to academics’ use of iPads for teaching in your institution. The paper has gotten positive social media traction especially on Twitter.